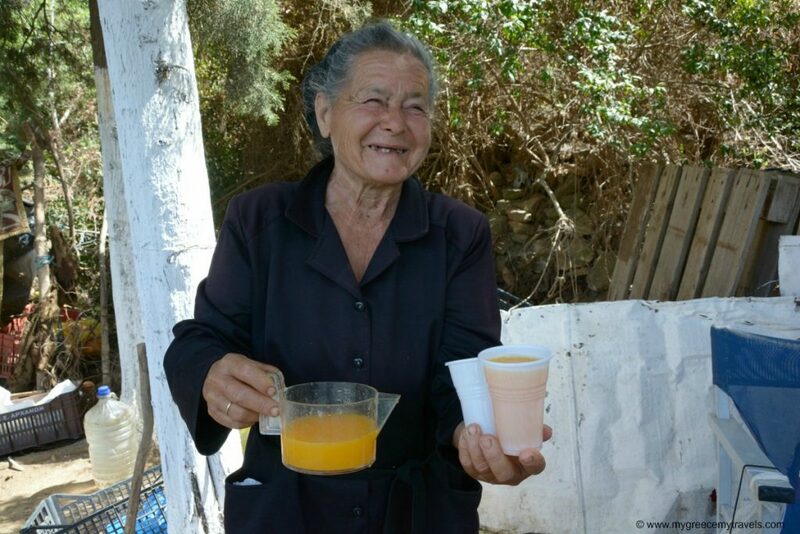 The things I learned in Crete ranged from the diversity of its fantastic cuisine to the warm character of its people to well… the unexpected. 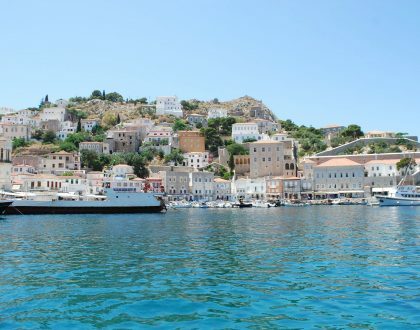 Here’s what I experienced on my first trip to Greece’s famous island. That’s what my friends and acquaintances would say with enthusiasm when they found out that I hadn’t visited one of the most famous and largest of the Greek isles. It was like I was left out of some big fantastic secret. As a travel writer and blogger, an initial trip to Crete had to happen — at least to see what all the fuss was about! Now, I can say I have checked Crete off my Greece travel bucket list. It realized quickly it is a huge island, one that would take me at least a month to visit all of the places I’d love to see and discover. Crete showed me its fascinating mountain village culture, serenely beautiful beaches and such warm hospitality. Oh, and that food! I loved the stuffed zucchini flowers, delicious slow baked goat, crisp salads prepared with the richest juiciest tomatoes and flavorful olive oil. I savored so many meals. I returned to Athens five pounds heavier knowing that I’ll definitely need to be back to eat more. Here’s my list of the 10 (plus one) things I learned in Crete in 10 days. I saved the best part for last. One of the top 10 things I learned in Crete – first hand – was just how good the food is. This is hochlie. 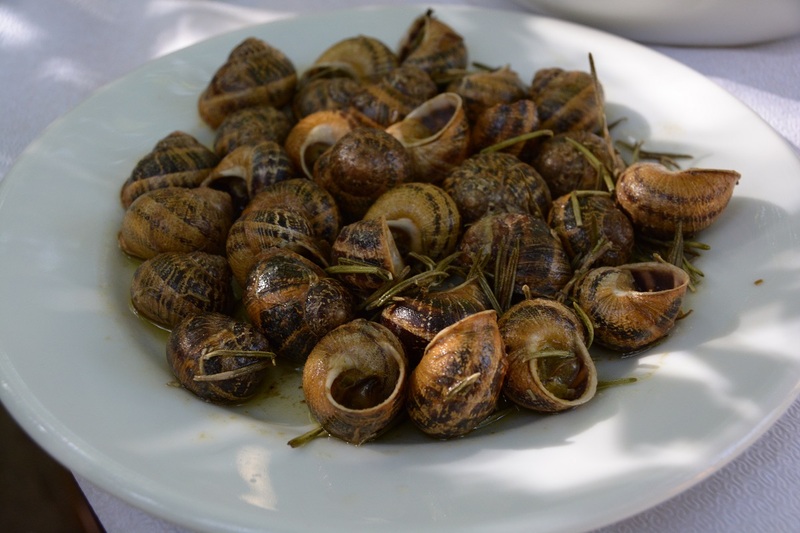 Cretan snails cooked in olive oil and rosemary at the El Greco taverna in Fodele. 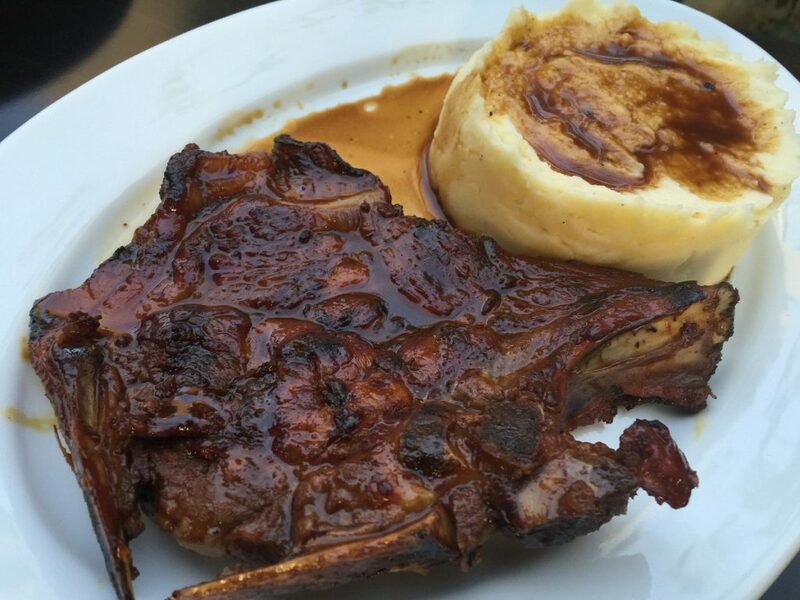 A pork steak with a wine must sauce and fresh potato puree at a taverna named Palia Poli in the old town of Heraklion. 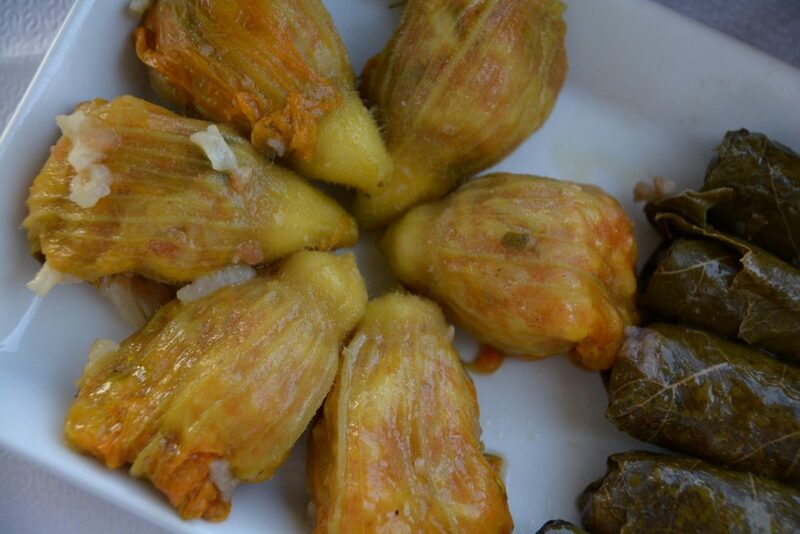 Delicious stuffed zucchini flowers at Nikolas taverna in upper Agia Pelagia. I was curious to see the difference between Cretan food in Athens and Cretan food in Crete. It’s kind of like Greek food in the U.S. It’s great, but its better in Greece. I guess you can say that about most ethnic cuisines. 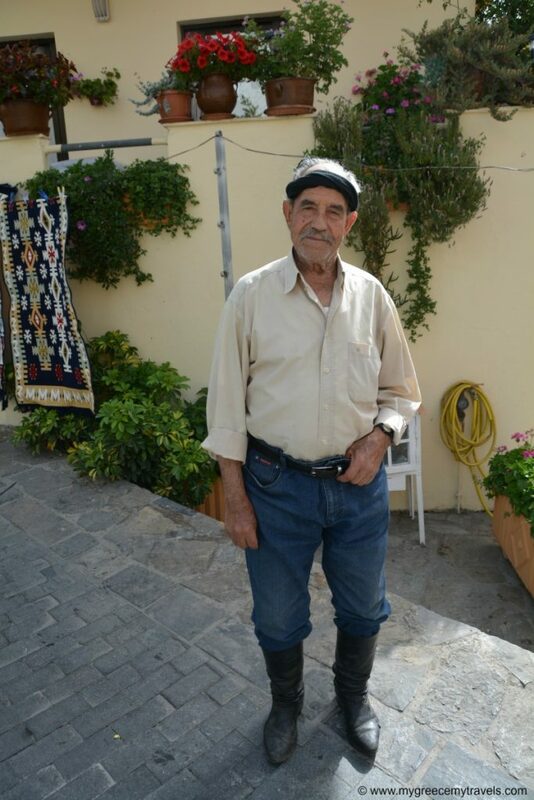 However, what I loved was that Cretans were extremely proud of growing their own veggies, fruits and raising their own livestock to create the dishes they served. This was the way all of Greece was anyway before the words bio and organic were tossed around. In Crete, all natural seems to be the only way to go. Talented chefs and restaurateurs were eager to point that out to me. Stay tuned for my reviews of some incredible places to eat in Heraklion, Rethymno and Chania. Check out my story about Peskesi published on the top food website Culinary Backstreets: Eating Local in Heraklion. 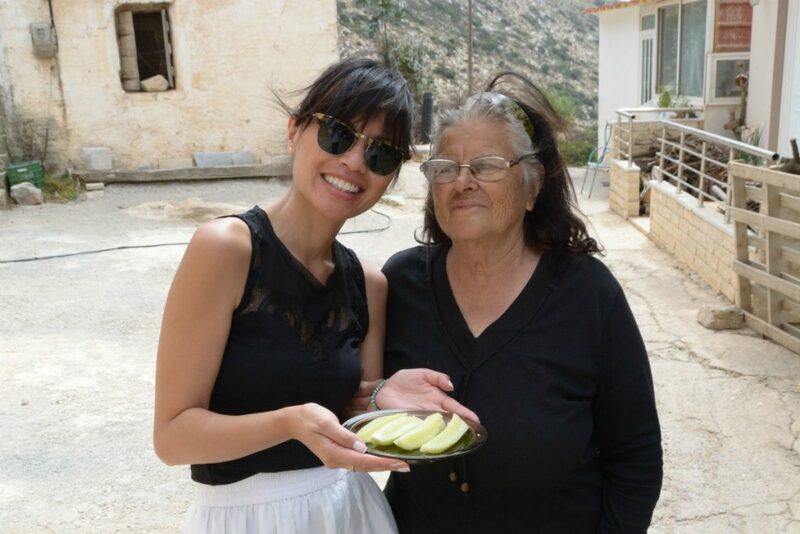 Ms. Eleni offers me salted cucumbers in Achlada. Ms. Georgia handed me some of her (tasty!) oranges. I was offered a total of four big bright oranges as well as a plate of sliced cucumbers from various yayas I came in random conversation with. Those lovely goodies came with warm smiles, too. Then, there were the complimentary servings of raki, an anise flavored spirit. See the next item below. 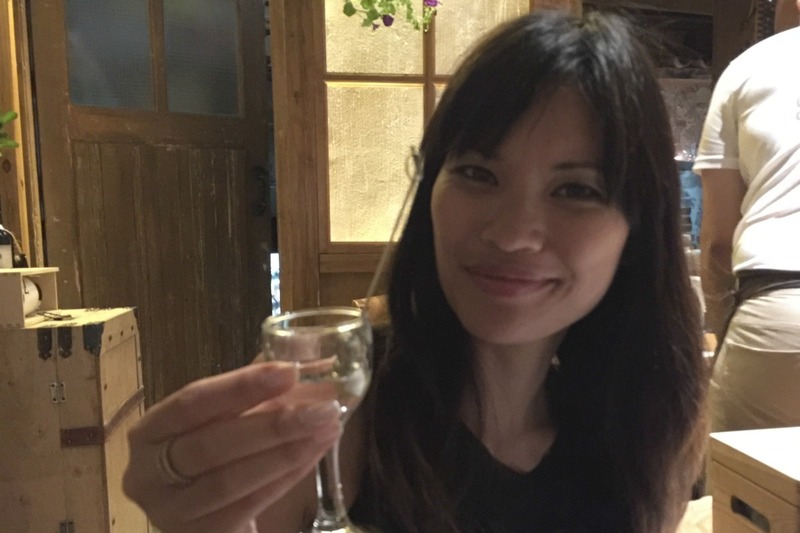 Raki to start an amazing Cretan gastronomy experience at Peskesi in Heraklion. Like ouzo in Lesbos, raki is a big thing in Crete. It’s a way of life, represents hospitality and it also happens to be a wonderful natural product of the region. I loved how I was served a little complimentary bottle of raki to get my meal started, or to end it, or as a “hello and welcome” offering at places I visited. The prevalence of raki culture was definitely one of the 10 things I learned in Crete. For those of you who don’t know, Crete in Greece is kind of compared to how Texas is viewed in the U.S. Crete and Texas both step to its own kind of wild and strong beat. In the U.S. we have a saying, “Don’t mess with Texas.” Well, don’t mess with Crete. This kind of rebel toughness is especially known to exist in the mountain villages of a region called Milopotamos. Stef has been reading a book about the resistance movement there during World War II, a time when brave Cretans rebelled against the Germans. He had filled me in on the history so on our way to the villages, I was hoping to find the people he’d told me about. Tall men with piercing blue eyes, dramatic countenances, big mustaches — all dressed in black with a traditional knife slung in the leather belt. A thing of the past? Nope. We met a few and had some interesting conversations. Stay tuned. 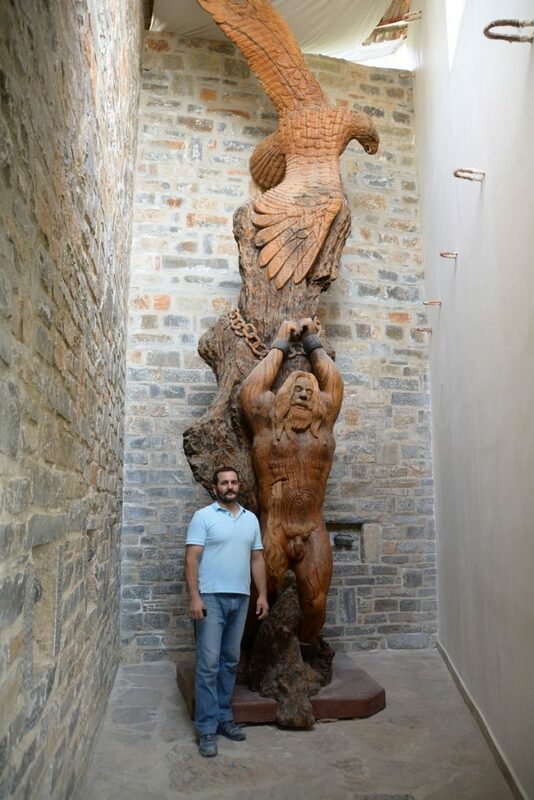 Antonis of Anogia told us he was caught and beaten by the Germans when he was 15. 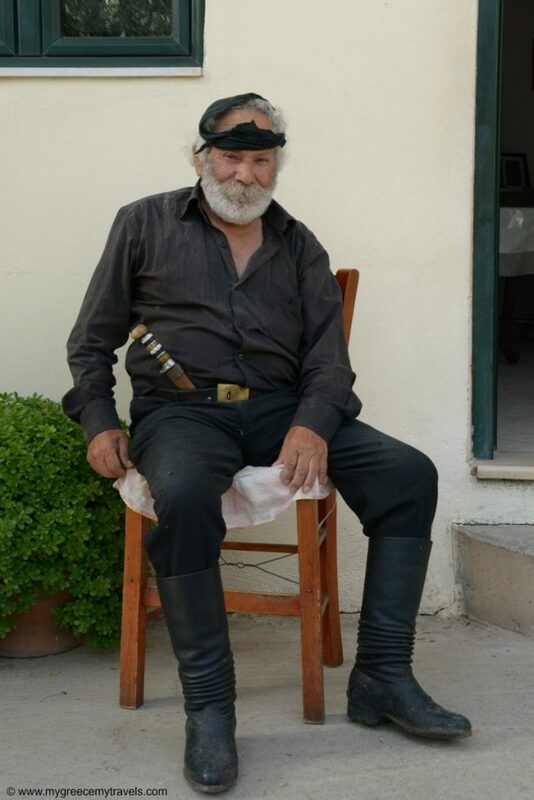 Manolis of Zoniana sitting outside of his house. Just when I think I know enough Greek, I face a Greek dialect. One funny moment in Crete was when I walked into a bathroom area and read the words korasia and kopelia on two doors. It wasn’t the Greek I learned. I couldn’t figure out right away which one was for women or men. As I was buying a handmade purse, I asked the lovely yaya who was selling it to me what her name was. She said something that sounded like “Nitchi.” It sounded non-Greek. I got confused, furrowed my brow and asked again. With Stef’s help I realized she was saying Niki. K is pronounced like a ch. T is tschi. G is kind of like a z – or something like that! As a lover of languages, I liked hearing the differences in Greek language. It was kind of like when I was in Zakynthos and picked up how the Greeks there spoke with a more melodic, Italian language rhythm. 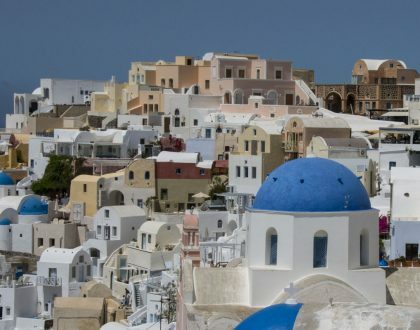 Another one of the 10 things I learned in Crete in 10 days had to do with the culture and accomplishments of the the first civilization of Europe, the Minoans. On a fantastic tour of Knossos, the ruins of a grand Minoan palace, my guide Emmanuel Tsagarakis pointed to an opening in the ground where some clay pipes could still be seen in the foundation of the palace. It struck me then. Imagine toilets and running water 5,000 years ago! I also saw up close the era’s art and pottery, amazing jewelry, impressive architecture and more. It all began with the Minoans on Crete island. Following the tour up with a visit to the Archaeological Museum of Heraklion was the icing on the cake. 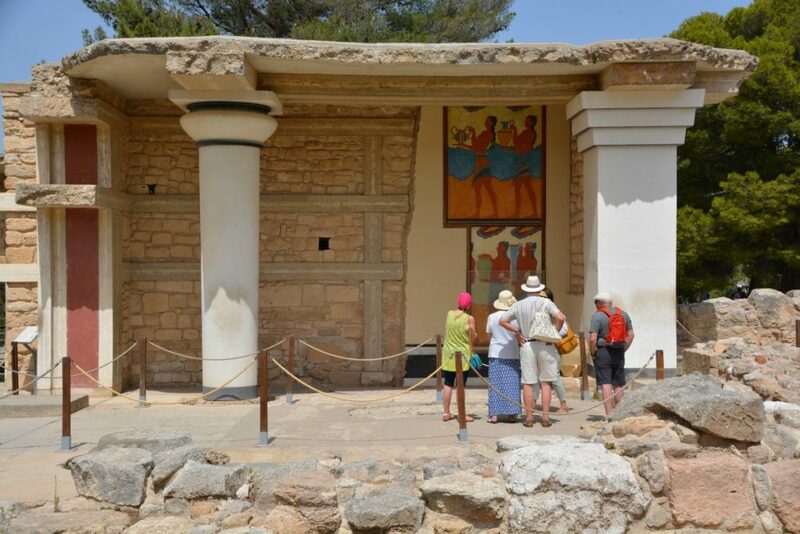 I learned in Crete that Knossos is a special place to explore for history lovers like me. Like the caretta-caretta (loggerhead sea turtle) of Zakynthos, I saw another endangered animal in Greece called kri-kri. 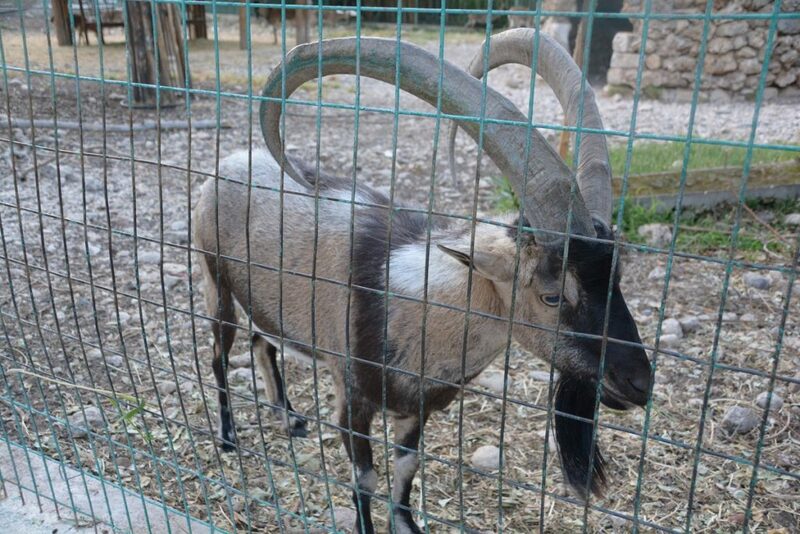 They are endangered because of inbreeding with other types of goats and, well, meat eating. There were a few kri-kri to greet in the city gardens of Chania. I have this joke with some friends from the U.S. that I have become a beach snob since moving to Greece. Well, the fact is the country is home to amazing beaches that seem to be everywhere. I learned in Crete that I really love Cretan beaches. 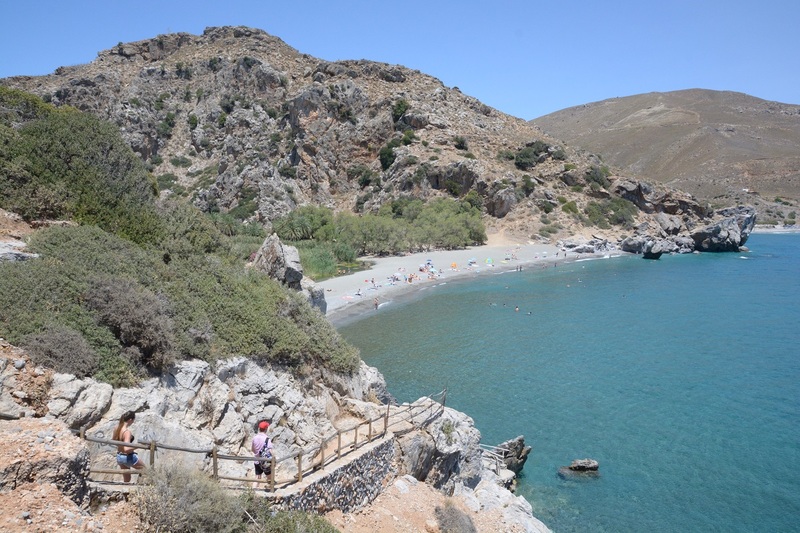 Check out my post: Photo Tour: Amazing Beaches of Crete to read about my top recommendations. Driving across Crete reminded me of traveling on other large islands like Lesbos or Kefalonia. 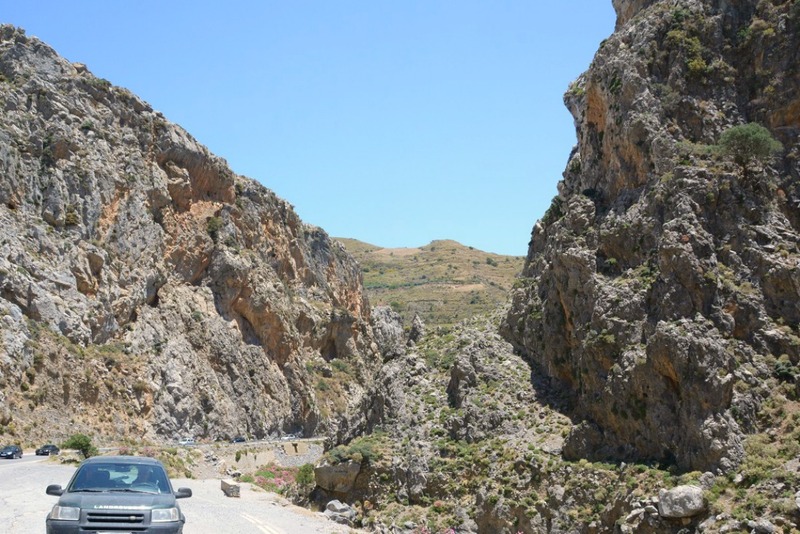 What I learned in Crete was that depending on where you want to go, the drive can be long. You can drive for an hour and not reach your desired destination. Unexpected stops to truly enjoy the view. Agiofarango Gorge was one of them. In the end, where you are going to in Crete will be totally worth it. Along the way you can admire the landscapes full of olive trees, scenic coastal views, colorful flowering plants, tiny villages, natural wonders (like this gorge) and some goats and wild rabbits prancing around here and there. It’s not just driving some distances. Sometimes you gotta hike it when in Crete! This is the way to Preveli. Worth every step down and up. We got to meet the best kataifi (traditional Greek dessert) maker in Rethymno (and possibly Crete), thanks to some last minute local advice. 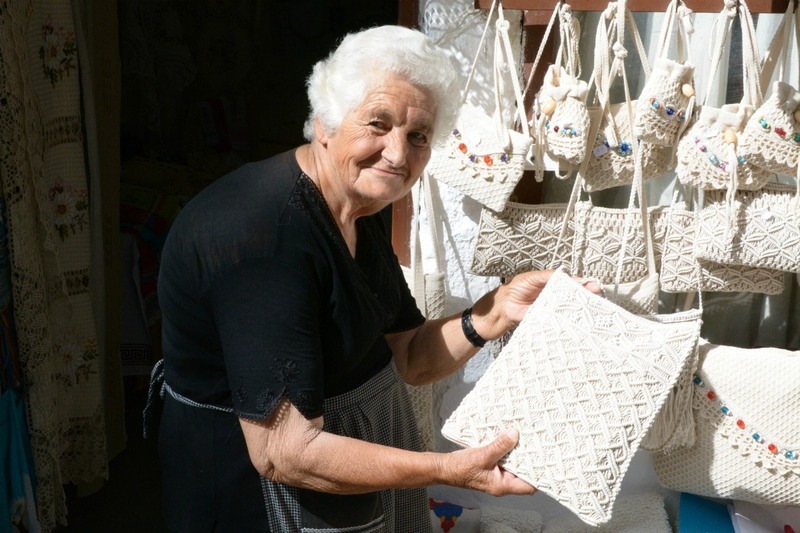 Giorgos Xatziparaschou has been running his shop with his wife Katerina since the 50s! He’s still going strong. By the way, the kataifi is fantastic. 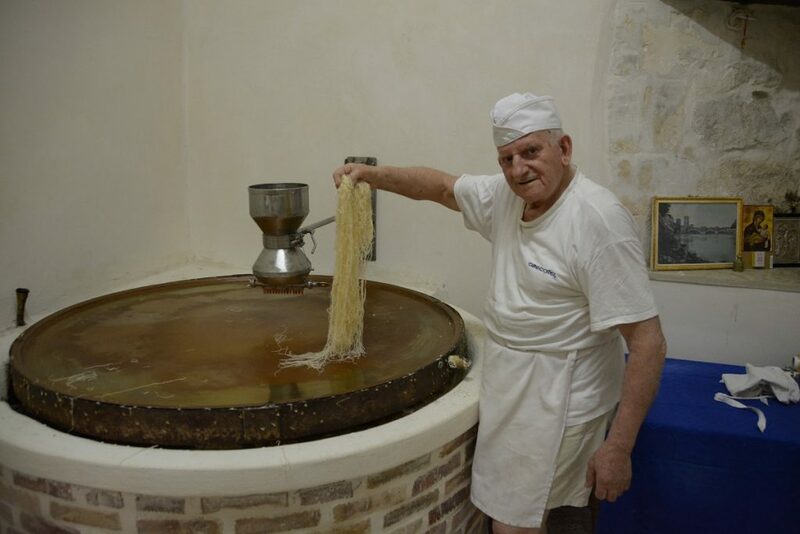 Check out my story about Giorgos in the food and culture website Culinary Backstreets called The Kataifi Master of Rethymnon. We explored the almost abandoned village of Achlada outside of Heraklion. It was truly eye opening to walk in and around the emptied out homes. Amazing views as well. What’s in store in Achlada? 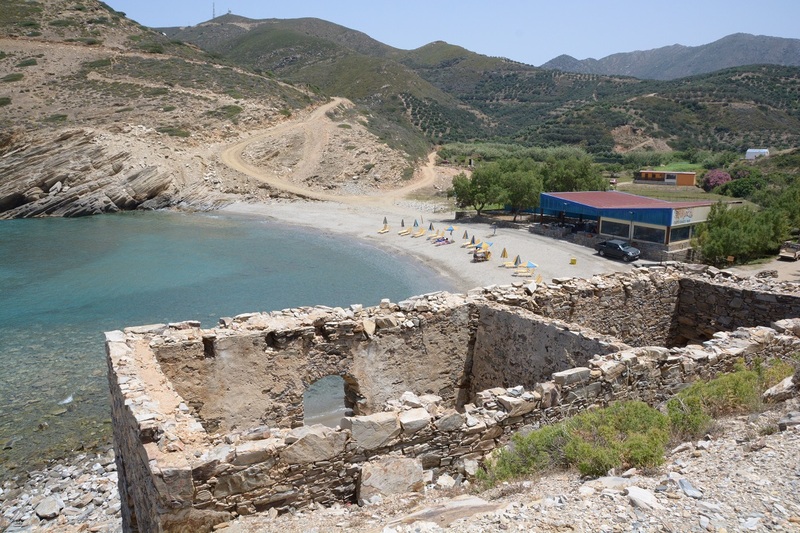 Even the unknown beaches of Crete are gorgeous and historic! This is Aliki outside of Heraklion. 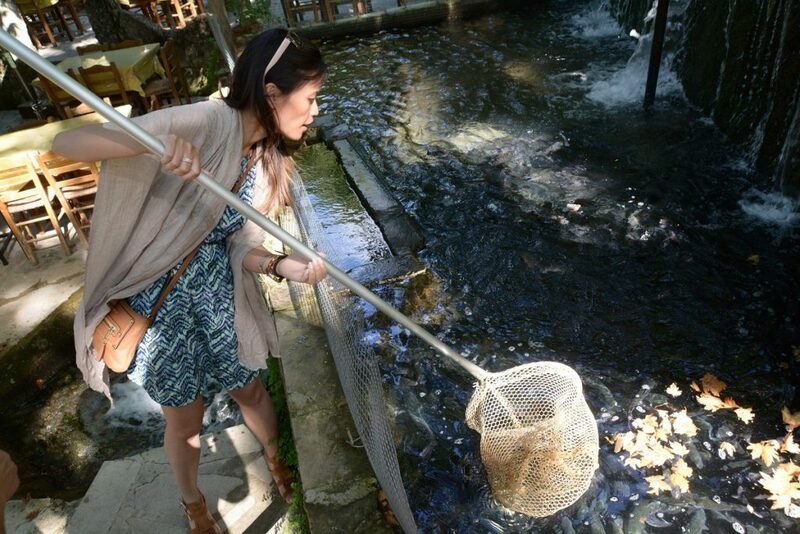 I also learned in Crete that the isle has tasty freshwater fish cuisine. 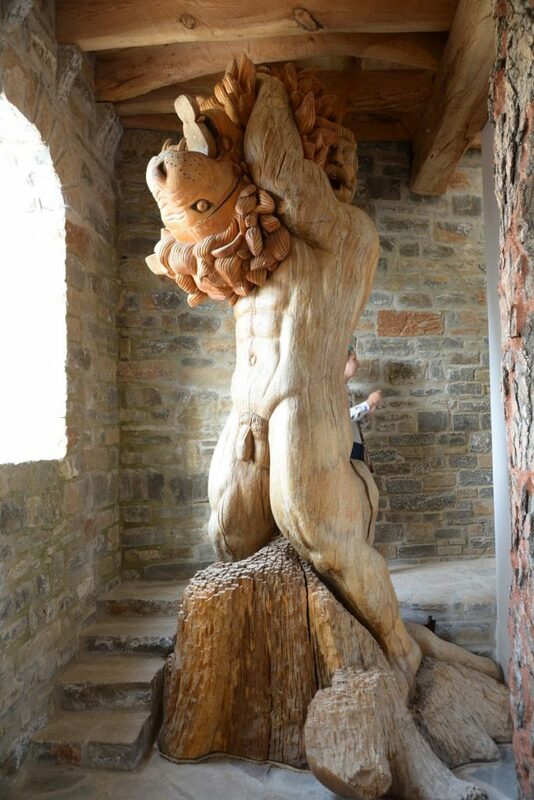 I loved stumbling upon the fantastic tavernas by the waterfalls of Argiropoli. The restaurants all specialize in river fish (sturgeon and trout) dishes. I even “caught” my own fish. 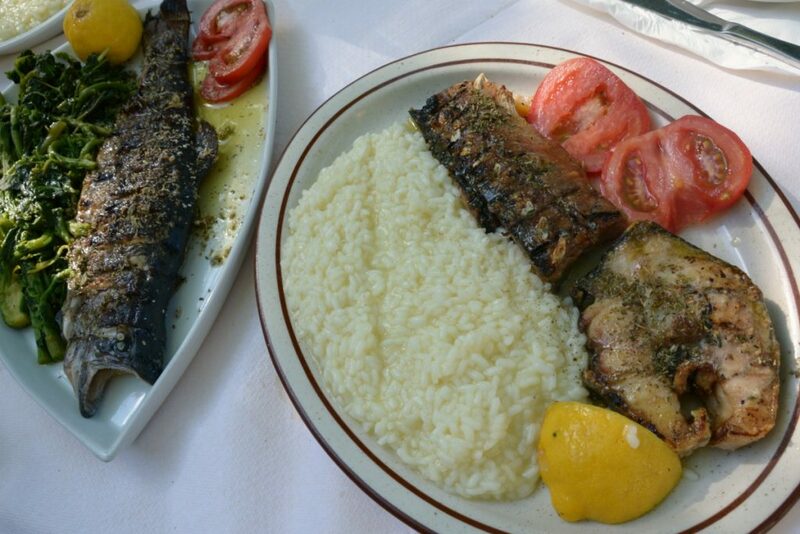 River fish dishes freshly cooked in Argiropoli. 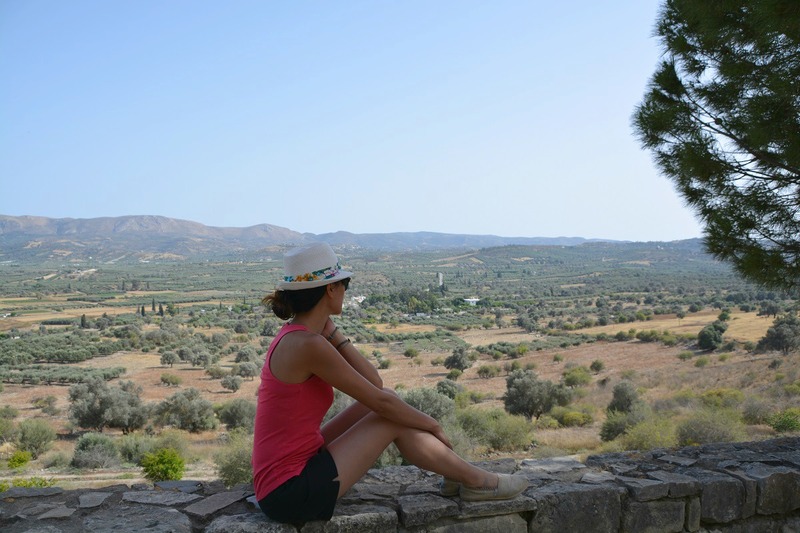 I was awed by the view as I toured the archaeological site of Phaistos Palace. It was so peaceful and the breezy winds that hit the slope of the mountain where the ruins remained were just perfect. 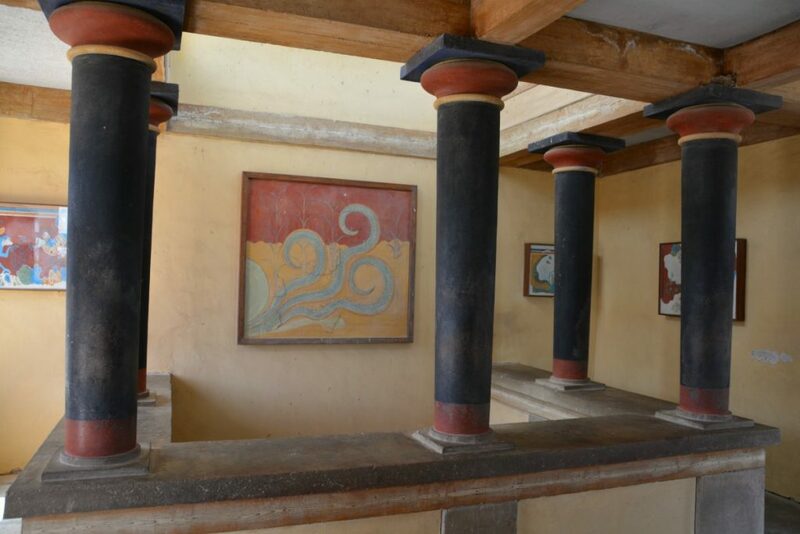 If it was anything like that back when the Minoans built the palace… I could certain see why they chose that spot. Perfect view, weather and ancient history at Phaistos. It was so great to hear different people’s stories. We wandered into the humble Georgios Koutanos’ amazing woodworking shop and museum tucked in his quiet mountain village of Axos Mylopatamou. What talent! There were many fascinating but unexpected travel moments within a span of 10 days. I am excited to share more things I learned in Crete with you soon. Be sure to sign up for my monthly newsletter for updates. Two airports, Heraklion and Chania, service regular flights to and from Athens and Thessaloniki. The airport of Heraklion also services flights to Rhodes, Kos and other Greek islands in summer. International travelers arrive by air, usually with a change in Athens. 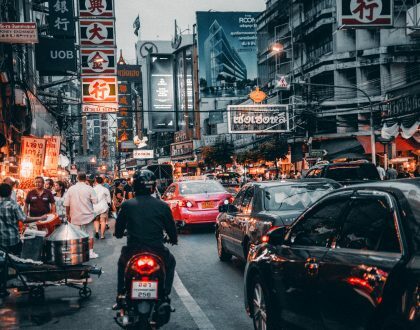 You can find the best flight deals with Kiwi. The easiest way to get from point A to point B on the island is by driving. An international car rental company I can highly recommend is Auto Europe. This post sums up the 10 things I learned in Crete in 10 days. Have you ever been to Crete? Is there anything you’d like to share about what you may have learned in Crete during your travels in Greece? Feel free to comment below. A great introduction to a fabulous island- like a nation in itself.you captured its many nuances- the accent, and the old Cretan men, and the goats in the central garden in Chania- the endless rugged drives. And the snails with rosemary. I’m glad you had such a wonderful time and am interested in Stefano’s book! Thanks, Amber. I really enjoyed it. It was a full 10-day trip. Oh, the snails with rosemary were so delightful. I never had them like that. It seems that your time, spent on that great island Crete was terrific ! Great post! This raki culture though is a fact, isn’t it? I couldn’t believe how much raki I have drunk on one day . Getting around and speak to Cretans just for say Hi! is a reason to drink raki! That simple! Love Crete! Hi Kelly, Thanks so much for your comments. Ha, yes lots of raki. I like how it is — raki equals so many things and yes, a good reason to drink it is for the company it brings. Love Crete too! Great post, I met Crete many many years ago, love it but much more the people! I think that they’re more hospitable than any other Greek! Hi Tzina, Thanks for the comments. It is very nice how hospitable they are… Greeks are hospitable in general but you are right, Cretans take it to another level. I met the nicest folks. What a great time you had in Greece. I am greek and still don’t know the dialect of the Cretans. They are a world unto themselves. Beautiful photography Marissa. Gia sou Mary! Thanks so much for the kind words. Yes, the Cretan dialect took me by surprise. I like the accent very much. It’s so charming. Very nice post Marissa… I Like how you describe your experiences, I like the pictures, nice!! Thanks for another great post as usual Marissa – superb photos! Off to Crete myself in 3 weeks so this very timely. My brother and I are trying to walk the E4 path across the island in chunks each year and hopefully will complete a big section in the SW around Agia Roumeli, Sougia and Paleochora which are also breathtaking parts of the island. Yammas! Hi Ed, Oh, thanks so much! Your trip to Crete sounds amazing. That’s really neat you do it in chunks each year. You must have some amazing insight and beautiful memories doing that together! I should think of some kind of trip like that with my sister. Yes, stin yammas! Such a nice post! Bringing back so many tastes and memories. You described all the beautiful things that make Crete the island I love most. 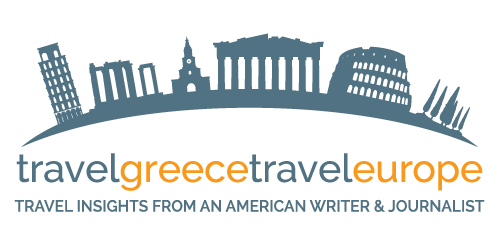 I want to read more of your Cretan experience! 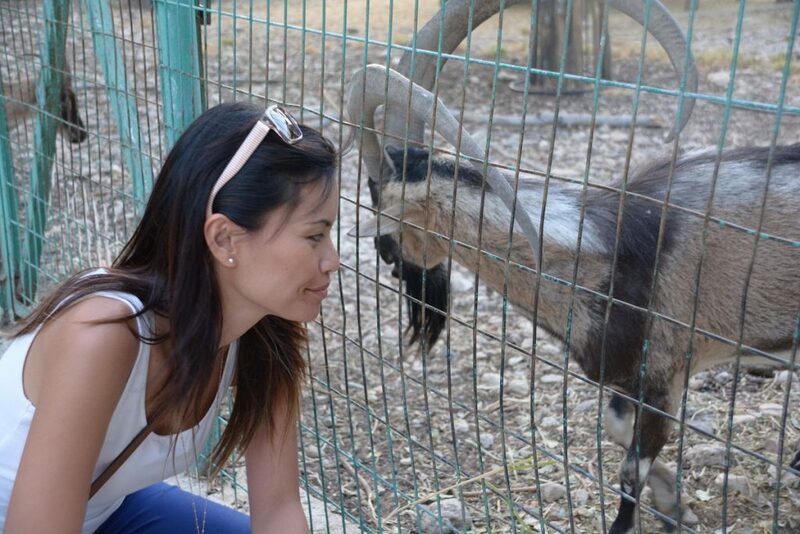 I believe yor blog will be very successful because you looks to love Greece. Hi Aristotelis, Thank you for stopping by and for the lovely comment! Greece is a wonderful place to be. Hi Dimitris, I will need to explore this area of Crete next time. I definitely didn’t have enough time. Crete is a HUGE island! Thanks for the tips. The snails look like an interesting dish to try. The photos are very nice! Looks like Crete is a great place to be. We look forward to our trip there. Oh, the snails are fantastic. We had them in rosemary and olive oil. Really delicious. Have a great time in Crete! From the study of the Linear B’ writing system, and also from the occasional oral mitigation of the -L- consonant into an -R- in the modern local dialect (for example, “thalassa” sounding somewhat like “tharassa”: https://www.youtube.com/watch?v=ZnyiS8g9oYM ), it becomes clear that the Ancient Cretans did not have the -L- consonant in their language, even though this sound is omnipresent, not only in standard greek, but also in the entire Indoeuropean [or Aryan] Language Group, as well as in the Semitic, the eastern branch of the Afro-Asian Language Group. From the study of the works of ancient writers, the obvious conclusion is that the Cretan aboriginals were non-Greek. Most probably they were Hamitic. This means that their language belonged to the western branch of the Afro-Asian Language Group. So, they were kin to the ancient Garamantes (as specifically suggested by Herodotus, as well as by myths presenting Garamas -the namesake of the Garamantes- as a son of Minos of Crete), and modern Berbers, like the Tuaregs. —> The Minoans did not speak Hellenic/Greek as their natural language, but they did contribute in the creation of the Classical Greeks. —> Their World did not disappear after the massive 1628 B.C. eruption of the volcano-island of Calliste (–> Thera –> Santa Irina –> Santorini). —> They weren’t conquered suddenly and destructively by the «Greeks», that is the Achaeans, but did witness a tumultuous change of constitution, from oligarchic republic (with the Titans as a society échelon, a caste of merchant-princes, electing a single hegemon every nine years (Minos II is called «henneaoros» by Homer, that is «nine-year-term»), elected -probably solely- by the Titans), to hereditary monarchy (circa 1450 B.C, after a civil war, a ..Titanomachy). —> Their writing system, Linear A’, was adopted by the continental Achaeans, adapted as Linear B’ in their Greek language. —> A dynasty change took place around 1380 B.C, from native (Keftiou) to continental (Achaean), after a coup d’etat from an Achaean mercenary, Tectamos. —> The Keftiou/Minoans and their Greek [Tectamus-dynasty] rulers suffered the consequences of the fall of the Palace Economy, which shocked the Aegean, almost in its entirety, shortly after 1200 B.C. Hi Stelio, Thanks so much for these interesting fun facts about Crete and the Minoans. 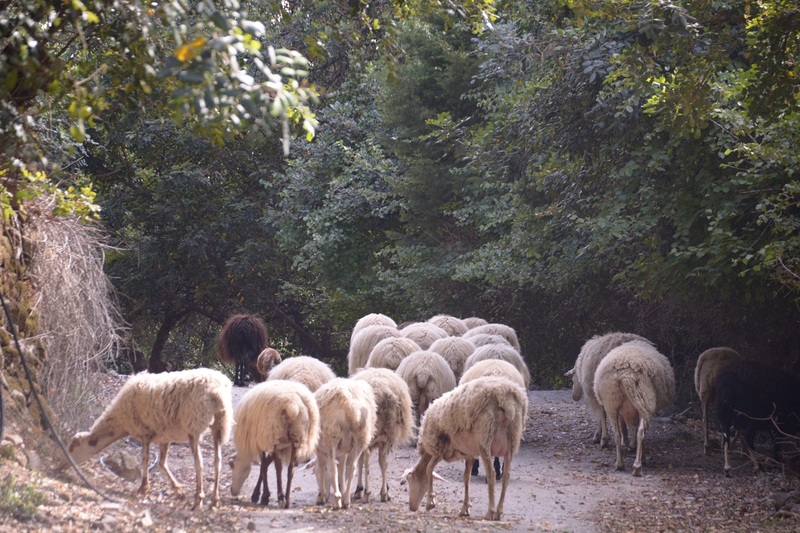 I really enjoyed learning about their culture while in Crete. Are you from Crete? Hi Lesley, Thanks so much for your comments. I suspect you live there? So, it’s so nice to learn your point of view about Crete. Sounds lovely indeed! Love that raki is the cure for all. Why not?! 🙂 Such a lovely culture. We do have amazingly beautiful places here in Crete to explore!! Hi! Thank you. Yes, it was fun to learn Cretan!! Wow. It will be a great trip for you then. Some things have changed and some the same, I imagine. What did you like the most during those years? I was in Crete twice and I will come back for sure again. I didn`t know about Phaistos! Beautiful photos, useful information. You succed in telling the beautiful things about Crete and its people!